Thanks everyone for your advice re the croup, the steamy shower thing seemed to really help and Anna is all back to normal now thankfully. Is it wrong to play dress ups with your baby like she is a doll? I went through Anna's clothes trying them out for size since she has outgrown so many now, and tried a few different outfit combinations. I took a photo of her in the little dress I made for her to wear in our family portrait taken last Saturday since I didn't take one that day. 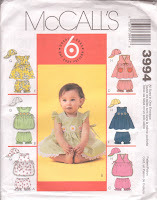 I used an OOP Butterick 400, which is a basic pattern for babies. I made the basic tunic view C, which even though I have heaps of patterns for this style this is the only pattern I have this small. It is marked 'one size only' so I went off the measurements this time so it is a much better fit, but it is hard to know how much ease to allow for given that Anna is still sitting frog legged and has a big nappy bum as well! But I made it to the pattern measurements hoping for the best and it fits ok, although I lopped a few inches off the bottom and it could probably lose a little more length still. It looks a little baggy and long when she is standing up, but fits just fine when she is sitting down which is most of the time so I'm happy with it. I made from a baby blue corduroy, and used a cotton polka dot facing, with matching fabric covered buttons and a band across the front finished with pink ric rac. Then she finally looked straight ahead! Thank god for digital cameras I say! And did you notice that one tooth she has? Well she has been putting it to good use, biting on everything she can get her hands on and she has literally been biting the 'hand' that feeds her if you get my drift! She bit me so hard the other night she drew blood, so if she keeps this up she'll be going on formula soon. I hope this doesn't mean she's going to be one of those naughty kids at school that bites everyone LOL! I never win anything, so to land this is a pleasant surprise. 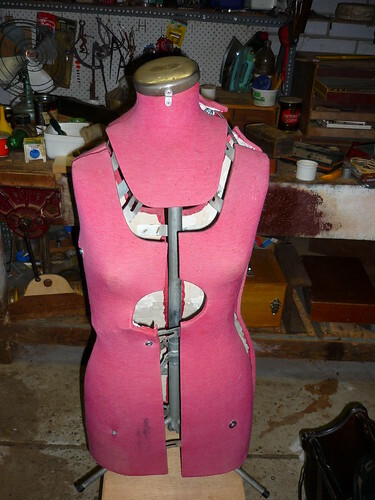 Hopefully it will be closer to my size than my current dress form, but if not I have so many projects on the go that a second dressform will certainly not go unused. Bec also has several other giveways happening at the moment, so if you live in Sydney pop on over to her blog to say hello! Isn't it cute? The bad thing however is that it is too big! I've been foiled again by bad sizing from the pattern companies. My fault though, I cut this out whilst Anna was napping and not wanting to wake her to measure her, I decided just to cut it out based on the pattern size for a 6 month old. Since she is now 7 months I thought it would fit, but luck was not on my size. However all is not lost, it will fit her for summer and the weather around here has turned cool again so I'm in the process of making her a little tunic that involves corduroy! and ric rac! Now I just need to finish it in time for Saturday. The plain horrible: Anna is currently suffering from her first bout of croup, and since she is still smiling and generally happy in between coughing I guess it's not as bad as the sounds emanating from her chest. Being first time parents, we had no idea what was wrong with her when last night around 10.30pm she started coughing like a sea otter, but thankfully in Sydney there is an after hours doctors service that gave us advice over the phone, and then within an hour and a half a doctor came to our home to check her out. Plus this service is fully bulk billed so it didn't cost us a thing (except in all the taxes we pay of course). Unfortunately there are no chemists open at 1.30am, even those in the seediest parts of Kings Cross where everything else is 24hrs, so we ended up at Concord hospital emergency department at 3.30am where they gave her a steroid dose which eased her symptoms and helped with her breathing so when we all got home we managed to get a little sleep (only 2 hours for my husband though before he went to work!). Thankfully the hospital is only 5 minutes from my house, I'll never curse the sound of those ambulance sirens again. There's been so much press lately about how terrible the NSW health system is, but our experience has been nothing but great. Sure Concord hospital is looking pretty old and run down, but the staff there have been so lovely and efficient every time I've been there I can't complain at all. And getting a doctor to come to your house, let alone at 1.30am? And not paying a cent for it? Now that is service. Anyway Anna is sleeping like a champion today, and even though she is doing her best Darth Vader impression she seems to be in good spirits so hopefully this will past in a few days and we'll be back to normal, well as normal as things can get around these parts anyway! Thankfully I had a pattern to work from which was pretty much like your standard dress pattern, although it is the multi size pattern from hell. Not only does each pattern piece have sizes from child XS to adult XXL, the pieces I used also were multi pattern - that is several similar but different pattern pieces were in the one pattern piece, so I had to get my trusty highlighter out and figure out which piece I needed to cut around. That was the hardest part of all of it though, because the tunic is of pretty basic construction being basically a rectangle front and back, rectangular sleeves sewn in flat with a little square gusset under the arm to give movement. It's meant to be loose and baggy because it will be cinched in at the waist with a belt, so no fitting was required which cut down on the time needed to make it enormously. The instructions were pretty simple, although they do suggest a large amount of handsewing, which I guess is authentic and rustic looking but I wasn't going to be that pedantic and used my trusty machine to make it all. It has a keyhole neckline, and I made the facing from a herringbone patterned wool in a maroon and white pattern and put it on the outside as a trim, because surprisingly enough my local Spotlight didn't really have a big range of Viking style braids! The rest of it is made from a cotton drill in a deep red colour, which should be sturdy enough for its purpose but not too hot to be worn during the warmer months when our climate is very much un-Viking like. I had bought a queen sized quilt cover from an op shop some time ago purely because I liked the pattern: a cream fabric with a yellow and brown floral pattern. It was a little bit too short to use for the curtains, and since I wanted some fabric to cover the pelmet I lopped some fabric off the the bottom and sewed on a contrasting panel from a sheet that I happened to have that is a good complementary caramel brown colour. I also had a whole roll of curtain lining and plenty ruffle tape in the stash, both also picked up from op shops over the years which was extremely handy because the only new things I had to buy were the curtain rings and ribbon. To jazz up the curtains a little to make them look like curtains and not bed linen hanging up, I sewed on a 1in wide yellow ribbon across the join of the contrast panel, toyed with sewing on some buttons but ran of out time so didn't. Don't you love it when those decisions are made for you? Annoyingly I think the curtains are a little long, but I blame my husband for that because he put up new curtain rod brackets and must have put them on too low, because I made these curtains the same length as the existing sheers that were over the window. I suppose I could re-hem these or get my husband to put the brackets a bit higher - or just ignore it until our next guests come to stay! Even though the in laws gave short notice to their visit, I'm pretty happy about to see them. My husband has taken the week off so I have a few extra pair of hands to help with the baby and it's almost like a mini holiday for me - now I have some babysitters I'm getting a haircut, a facial and possibly I can even squeeze a massage in. I may even turn up to mothers group on Wednesday without the baby so I'll be able to finish a cup of tea for a change. Plus my mother in law is a whir of activity, cooking, cleaning and making cups of teas so it's been great so far! Marie-Christine - I'm definitely trying to do too much, that is in my nature and I just can't help myself! And I totally agree with you in not doing more than necessary, but this particular pattern was designed to be made as two pieces sewn together so there were no facings and I couldn't be bothered drafting any. Plus with only a few seams it didn't take that much longer to fully line it and using that tutorial is much quicker than the way the pattern called for. But don't worry I look for shortcuts everywhere, in fact if I ever meet the Slapdash Sewist in real life I'll arm wrestle her for the rights to her blog title! Lindsay T - I'm not neglecting my sleep, in fact I feel pretty good these days. Little Anna and I have to a truce of sorts - she sleeps nicely for me usually three times a day, and I let her sleep in my bed for half of the night which she loves. Secretly though I don't mind at all because it means she sleeps in to a decent time in the morning, and she doesn't wake up when she's in our bed like she does in her cot. I've managed to finish another UFO - yay for me! Of course if I didn't have so many UFOs in the first place I wouldn't have so many to finish, but that's another story altogether. This is the third time I've used the shell top pattern from the now OOP Vogue 1826, and each one has turned out brilliantly. This one is made from a polished cotton which I purchased a few years ago from The Silk Shop in Sydney which has now sadly closed down but used to sell the most beautiful fabrics. Unfortunately the fabrics were too beautiful and too expensive (my eyes goggled at fabrics that were $100 - $300 per metre! )for my sewing skills at the time, and this was the only fabric I purchased. It is a Swiss cotton, and even as a remnant of 1m it cost over $20. No reason for not finishing this one other pure laziness. I purchased this fabric at least 3 years ago, cut it out and sewed the pieces together, but I hadn't cut out a lining and so it sat in the UFO pile for no good reason at all! I made the same changes to the pattern as I did for the previous ones - used buttons down the back instead of a zipper, mainly because I liked the look of the buttons and didn't have a suitably coloured zipper, and I also made it using the technique for sewing a lined sheath dress (from this tutorial). I don't particularly like how some sewing patterns for sleeveless lined dresses/tops require the arms and necks to be sewn up leaving the shoulder seams open, and then hand finishing the shoulder seams after turning inside out - mine always looks wonky and just wrong. This method in the tutorial is far better - it requires leaving open the side seams, sewing all other edges, turning inside out and then sewing the side seams of the lining and fabric in one long seam. I don't know if I'll be wearing this one anytime soon, as the fabric is white with brown spots which matches too closely to my pale freckly arms to wear sleeveless! Plus it is still winter in these parts and this fabric isn't stiff enough to wear vest style as the black one in my previous post. But it does wear nicely under my favourite RTW suit (which still fits thank god), and since I'm not back at work until next February this top may hang in my wardrobe for a while. But the point is that I have finished another UFO and it has moved from the 'to do' pile to the 'done' pile.